Shop 65/7 Bonner drive Malaga markets, with over 6k of visitors per month that says it all. Allow arround 8 delivery days for back orders! 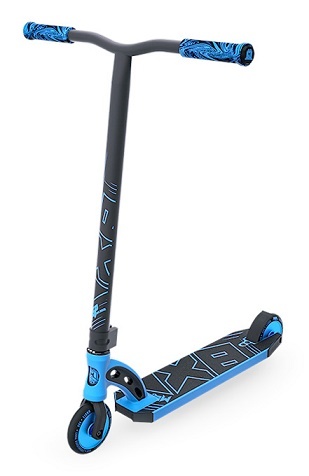 Madd Gear Pro VX 8 SCOOTER SETS THE BAR FOR QUALITY AND SPEC WITH EVERY ASPECT OF THE PRODUCT TAILORED TO MEET THE NEEDS OF THE UP AND COMING PRO RIDER. • DECK: MGP 83º INTEGRATED 19.5” LONG X 4.5” WIDE VX8 6061 T4 & T6 HEAT TREATED & FLUTED WITH 3º CONCAVE. • BARS: 21” WIDE X 23” HIGH 4031 JAPANESE CHROMOLY POWDER COATED UPSWEEP FLUTED BAR. ampro skates Ellenbrook was established in 2015 as a true amateur pro skate and scooter outlet. Our dream was to combine our 40+ years of skating and technical experience and create a one-stop shop which caters to both the amateur & professional skater. Carrying large stocks of kick scooters suitable from toddler age, right through to the pro rider. Brands of complete scooters and parts we stock are Envy, Flavor, Madd Gear, Crisp, Grit, Ethic, Samurai, Protec, Globber, Fox, Venice & District. also stock a comprehensive stock of spare and replacement parts, headsets, hand grips, bearings, wheels, bars, decks, helmets & bolts. Being involved in the WA Roller Derby community, and pro scooter riders, Ampro Skates stock the appropriate quad skates and protective gear. We carry Crazy Skates, Bont, 187, Triple 8 & offer a wide variety in stoppers, plates, spare parts, wheels, bearings, protective gear and apparel with lots of skates and inline blades suitable for children, including those which can grow with your child’s feet. massive range of coloured laces, socks and novelties. Just recently improved the range of skateboard stocks, including novelty light up penny boards, longboards & double kick. Brands include Gopher, Trinity, Madd Gear, Eternal & NaNa. We also offer spare parts, blank boards, trucks. Take advantage of our kids protection pack, with any set of skates, blades, scooter or skateboard, we offer a safety pack valued at over $100 which includes helmet, knee pads, elbow pads and wrist guards, all for $49.00. With extensive technical expertise, we can undertake both major and minor repairs from bearing, headset and bolt replacement, precision grip tape application, cleaning, respraying, cut downs, redrills. Staff , pride ourselves on our ability for custom builds. If you’ve a dream, we can build it for you. Come chat to our techs today and get your dream under your feet today. Great service, range & advice. Highly recommended. ampro skates is the first and only family owned skate and scooter store in W.A since 2015, with owner's in retail since 1973.